When the series returned for Series Seven, there had been a gap of five years (1994-1999 in filming terms, 1996-2000 in broadcast terms). It was brought back by popular demand and largely thanks to the American television channel A&E. The series opener was a clever choice – based on the novel The Murder of Roger Ackroyd, first published in 1926, in which Poirot has retired (a convenient explanation for the four year absence). It was adapted for television by Clive Exton and directed by Andrew Grieve. Given that the narration of the novel is an essential part of the solution, Exton’s job would always be a difficult one – indeed, almost impossible – and he doesn’t quite succeed. Many Christie fans would probably describe the adaptation as a disaster, but I won’t go quite that far. What makes Christie’s novel such a crime fiction masterpiece is the clever narrative choice and the big surprise it gives the reader in its final chapters (I will have to reveal the plot, so if you haven’t read the novel or watched the adaptation, you should look away now). Exton decides to let Poirot read the murderer’s novel as a journal in a voice-over that runs through most of the episode (though very little of Christie’s actual words are kept intact in this voice-over). In itself, this decision isn’t necessarily a bad one. Of course, he could have had Dr. Sheppard read it, but that would possibly be a bit too revealing. Letting Poirot/Suchet do it neutralises the narrative, which sort of works, I guess. In any case, it does allow for some reflections by Poirot at the beginning and the end of the adaptation . Those two scenes in the bank vault are brilliantly scripted, I’ll come back to them in the ‘Characters and actors’ section. Now, to the plot changes. After the opening scenes, Exton adds a scene in which Sheppard and Parker go to Poirot’s house (he isn’t living there incognito in the adaptation, which is just as good, since Poirot would never be able to hide away anywhere, a fact that is often referred to in the books – and remember that the other adaptation in which his identity was an issue, ‘The Third Floor Flat’, the scriptwriter also does away with the entire incognito business). This scene is quite well done, and wonderful from a characterisation point of view, because we get a glimpse of Poirot’s cottage life (an entirely square cottage, with neat, orderly rooms, perfectly timed clocks and a garden with vegetable marrows). As I’ve discussed elsewhere, the scene in the garden was added on Suchet’s request, because it is in the novel (well, sort of). 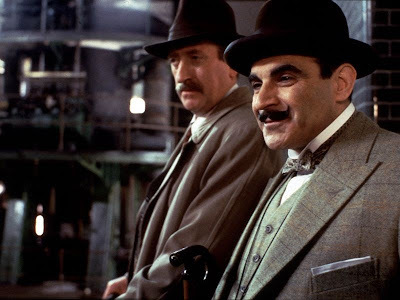 Second, Exton adds a visit to Ackroyd’s factory for Poirot (and it is revealed that Poirot lend Ackroyd the money he needed to get started several years ago). Third, the novel’s Inspector Raglan is replaced by an Inspector Davis, and of course Chief Inspector Japp is added, too. Japp’s presence is one of the main flaws in Exton’s script, if you ask me. By adding him to the story, there is no room for a Holmes-Watson relationship to develop between Dr. Sheppard and Poirot,and consequently Dr. Sheppard’s character is seriously marginalised throughout. This, in turn, weakens the surprise ending, because Sheppard isn’t in Poirot’s confidence (if anyone ever really is) to the same extent as in the novel, and we end up regarding him as just another suspect – not a Hastings character. Also, since Sheppard is marginalised, so is Caroline (sadly, since she was an inspiration for Miss Marple). Third, Exton allows for Poirot to make a visit to Mr. Ackroyd the same evening that Sheppard is invited to dinner (and he later turns up just as the murder has been discovered, as well). This is a nice way to ensure that Poirot has the facts of the case straight from the horse’s mouth so to speak, and to underline the friendship between him and Ackroyd. Fourth, three characters are deleted: Captain Hector Blunt (who was little more than a love interest / red herring), Miss Russell and Charles Kent (again, a red herring). Fifth, we come to one of the more peculiar changes; the murder of Parker, the butler. He didn’t blackmail anyone in the adaptation, but it is hinted that he might start to reveal some family secrets since he wasn’t given any money in Ackroyd’s will. Granted, Sheppard does explain that he was afraid he would remember that he had been alone in the room. Still, the hit-and-run and his drunkenness seem overdone and completely unnecessary. Sixth, Mrs. Ackroyd’s conversation with Sheppard is deleted, and so is the mah jhong party and several of the villagers, but these chapters and minor characters don’t feel missed in the adaptation. Finally, we come to the most serious change of all. The denouement is unlike any other. Not only is it unusual in the sense that Poirot doesn’t really get to explain anything (Sheppard takes care of that). It also provides us with one of the most ridiculous chase scenes the series has ever seen (and that’s saying something). After conveniently confessing to every aspect of the crime, Sheppard makes a run for it with the help of a gun he is handed by Caroline Sheppard (who has read his journal in the car – another curious change, since she is supposed to be unaware of her brother’s crime). In short, the chase scene consists of Sheppard shooting blindly around Ackroyd’s factory (missing Poirot and Japp every time), and Japp counting the number of bullets he has got left. He then goes on to commit suicide with the final bullet. In the novel he committed suicide with veronal (like Mrs. Ferrars). I don’t know why Exton felt the need to make this change, but I guess it was either because he or ITV felt the original ending was too tedious for a ‘modern’ audience or because it was requested by those who provided the capital, A&E. I don’t know. In any case, it does mar the adaptation. However, despite the significant changes, I can’t bring myself to dismiss the adaptation as a complete and inexcusable disaster (like some Christie fans do). My main point in favour is the magnificent way in which Poirot’s retirement is depicted. For instance, I particularly enjoy the visit to Poirot’s old flat – a scene in which he begins to come to terms with the ghosts of the past. In the end, then, the adaptation is acceptable – not fantastic, but not a disaster either. Andrew Grieve’s directing is as good as always. I have recounted elsewhere the lovely homage to the original opening sequence in the bank vault scenes, which I find a lovely way to re-introduce Poirot after such a long absence. Also, I enjoy his play with shadows and light, and particularly the glows of a candle (in Mrs. Ferrars’ room) and a close-up on Poirot stumping his Russian cigarette at the factory. It’s nice to see that the quality of the production design survived a four-year hiatus (even if the set of the flat seems to have been remade for these episodes). Locations used include the village of Castle Combe, Wiltshire and ‘Kit's Close’, Benham's Lane, Fawley, Wycombe, Buckinghamshire (Ackroyd’s house) – and of course Charterhouse Square in front of Florin Court / Whitehaven. Ackroyd's factory was filmed in Kempton Steam Museum. Gunning’s soundtrack is particularly good in this episode. He has added a more sombre tone to the theme tune, which is used throughout (again, a nice way to show that Poirot is back). Of the guest actors, Oliver Ford Davies is the main standout. I once read a review which stated that if it hadn’t been for the quality of Suchet’s and Davies’s acting, the episode would probably feel terrible. They bring all their gravitas to the roles and contribute significantly to the quality of the episode. The "AGATHA CHRISTIE'S POIROT" series is filled with many ridiculous and unnecessary chase scenes, but this one took the cake. Can you tell me if the white house used as Ackroyd's home was used in other Poirot episodes? It looks very familiar. I don't think they used that particular house in other episodes, but it's quite similar to the one used in "The Double Clue" and "One, Two, Buckle My Shoe". Is it implied that the chase scene ruins the factory, so Ralph won't get the inheritance he thinks he's going to get? I think it would have been possible to retain Sheppard's narration by eg having him apparently telling the story to an unseen listener, only for it to be revealed at the end that he's speaking directly to the listener and giving his confession. Strange that the adaptation leaves the crucial scene of Sheppard in Ackroyd's study until the end. For someone who always claims to be at odds with the class system, Suchet's Poirot is always ready for the servants to take or return his hat and coat - and even expects Raymond to do it in their absence! The scene where Poirot asks Sheppard to repair his clock is a nice way of introducing the doctor's hobby of tinkering with gadgets. Directly to the VIEWER not the listener! Sorry. Poirot gets some lines at the end about how he thought he could escape crime by moving to a village, but the Ackroyd case taught him that the supposed peacefulness there is fake. That doesn't seem to quite work. I mean, it doesn't seem like he would have been that naive up until the Ackroyd case...had he never seen a murder in a village before this? Even in the earlier cases, didn't he always harp on everybody having something to hide? I think the point with those lines was to start refocusing the character a little. As Suchet has mentioned several times, he tried to darken Poirot as the series went on, and bring out his disillusionment and loneliness. I've always seen this as the most obvious starting point for that. Of course, he has never been naive before that, and more than s few of the earlier cases proved that villages could be ideal places for murderers :P But here, he feels betrayed by a friend and neighbour, by people he has grown to like and care about - and still murder seems to follow him around. That's the realisation - that he can't escape it. As Suchet puts it, he sees it as his duty to rid the world of crime, and he understands that he can't simply move away and retire from that duty. If that makes sense. It's not naivety, it's just about volume. There's crime all the time in cities, but villages are much quieter. Another mistake that Exton had made was to allow Caroline Shepphard stumble across the journal before Poirot could reveal the murderer. If Exton was trying to hint that she was killer, it was clumsily handled and ineffective.